Ethics, morality and personal hygiene require of modern man a special attitude to their own appearance. But a well-groomed appearance is not only the correct style of clothes, trimmed nails, fresh breath or washed head. Among other things, is well-groomed skin of the hands and feet. Unfortunately, not everyone can boast. Unfortunately, the condition of the skin on the fingers and toes of some people is not a joke can upset: she simply begins to climb round. According to medical statistics, more often affects women. Often the skin on the fingers and toes. in connection with the lack of vitamins A and E in the human body. This is mainly observed in winter or early spring, since during these periods the supply of vitamins in the body dries up. In this case, doctors recommend to reconsider its menu by adding more fruits and vegetables. You can begin taking a special vitamin-mineral complex. 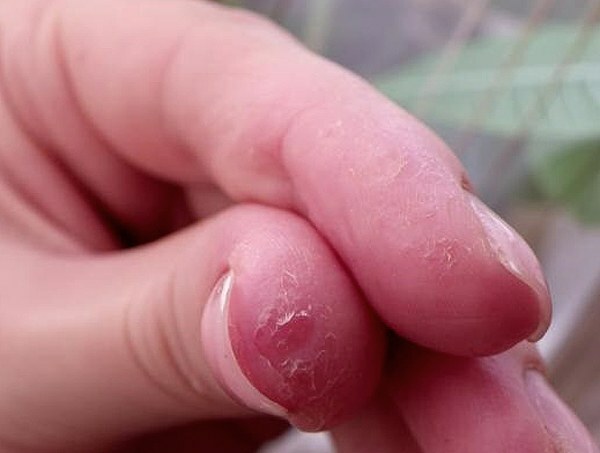 A common reason the skin on the fingers tends to shearing, are aggressive washing machines, gels for washing dishes, washing powder and other household chemicals. The fact that these tools can have a negative impact on the skin, destroying its top layer – the epidermis. This often becomes a cause of more serious diseases: dermatitis, eczema, allergies. To avoid this, doctors recommend to do all your home business exclusively in rubber gloves, and after – carefully to wash hands, causing the skin moisturizer. The next reason on the fingers of the hands and feet peel off the skin, it's stress. The fact that certain nervous situation, provoke the failure of the metabolism. In turn, the response of the body is the violation of the skin on the hands and feet. The solution is to stop being nervous or begin taking anti-anxiety medications. Often the skin on the fingers. because of the prolonged and constant contact with water, and as a result of contrasting changes of temperature or conditions. Curiously, this can happen during pregnancy. Here the reason will be lack of vitamins. In this case it is not necessary to postpone visit to the doctor. Self-treatment is inappropriate here. The skin on the toes can peel, and for their own reasons. For example, excessive sweating of the feet makes the skin loose and defenseless: it is exposed to direct attack of germs. As a result, can develop a fungal infection that affects not only the toes but the whole foot and even the nails. Doctors say that the treatment of some fungal infections can be carried out over the years, especially if it was running. To reduce the risk of such infections to a minimum, doctors recommend to carefully observe personal hygiene, do not wear someone else's shoes, change socks often. One of the most frequent problems in which the skin on your feet begins to climb round is insufficient hydration. In principle, the treatment here is not particularly difficult: the affected areas are treated with a pumice stone, which removes from the feet of dead skin and after this treatment, apply a nourishing cream containing in its composition the necessary vitamins and nutrients. In order to most accurately determine for some reason the skin on the fingers and toes peels, you need to seek the assistance of a dermatologist. Only it with maximum accuracy to determine the cause of this illness and to prescribe an appropriate treatment.